It is undeniably painful when you lose the people you love. However, that does not mean that you can no longer reminisce the moments and memories of your loved ones when they were still alive. What makes it even better is that you can share such moments with other people who share the same loss as you do. One best way to do so is by providing them with funeral bookmarks. 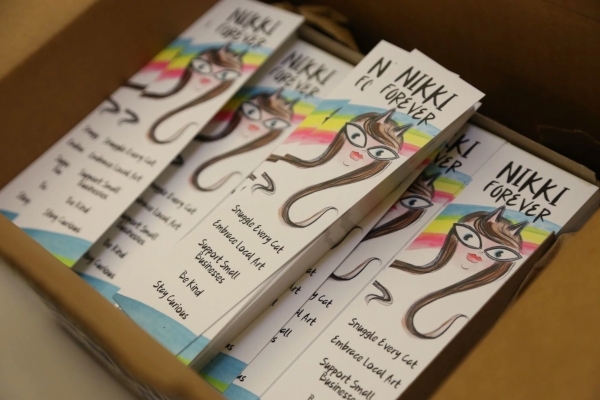 Through bookmarks, you will be able to look back to the colorful life of your dearly departed loved ones and share this to other people in their lives. If you want to create a funeral bookmark for your loved one who recently passed away and that you also want to share this with other people whom you share the same grief with, look no further because, in this article, we have provided some funeral bookmark examples and templates that you can download and edit for your use. Your loved ones may have already passed away but this does not mean that you cannot keep their memory alive. Fortunately, you can easily do so with the use of this funeral bookmark template. This template is convenient for anyone to use, even to non-designers. Aside from the fact that this template is free for you to download, you can also easily incorporate your own content since this is customizable enough to make it more personalized and more reflective of your loved one’s life and memories. Aside from making the memories alive of the deceased, you can also make use of funeral bookmarks as a guide during funeral services. You may include short prayers that the attendees are ought to recite during the funeral service. It is also best if you make the prayer personalized and fitting to your departed loved ones. Aside from that, you can even include an anecdote about your loved one so that wherever you go, this bookmark can serve as a memento that you can bring anywhere you go so your loved one’s memory will live on forever. Even in the midst of deep sorrow, it is still possible that you can look back to the good memories made by your departed loved one. 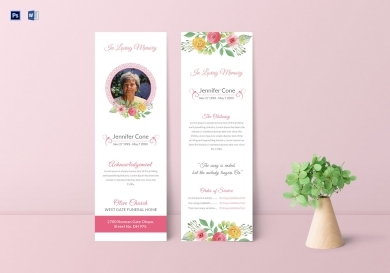 One of the best ways to do so is to input in on a funeral bookmark templates because this allows you to share it with others who shared the same grief and that you all would want to soothe all the pain you are feeling. 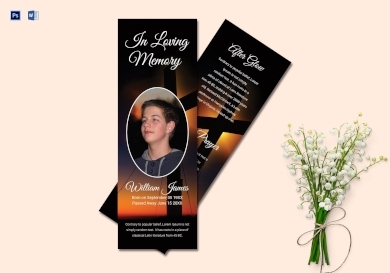 With the use of this personalized funeral bookmark, you will not only be able to bring back their memories but you will also be able to share and add some important highlights of how the person had lived his or her life. Are you looking for a simple design where you can input the good memories of your loved ones who recently passed away? Then this printable funeral bookmark may be the perfect template that fits your preferences. Even with its simple floral layout, you are not deprived of an ample space where you can add in a short composition that will enable you to narrate your loved one’s good deeds, unforgettable moments, and precious memories. Keep in mind that when it comes to design, simplicity is better and it means more, and this means that its significance will become more emphasized especially to those who will be receiving the bookmark. Funeral bookmarks don’t have to give you a feeling of sadness over a loss of your loved ones. A funeral bookmark doesn’t have to make you choose bland or gloomy colors. 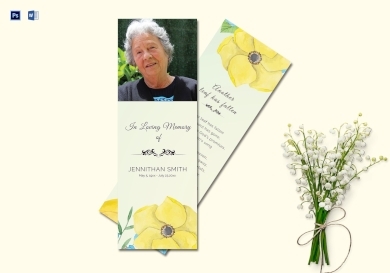 If the person you are making the funeral bookmark had lived a colorful and wonderful life, you have to make sure that you will be able to reflect that on your funeral bookmark design. One way of doing so is by making use of fun illustrations such as this funeral bookmark example that shows an illustration of the deceased. Instead of using images, you may opt for the use of illustrations if appropriate. 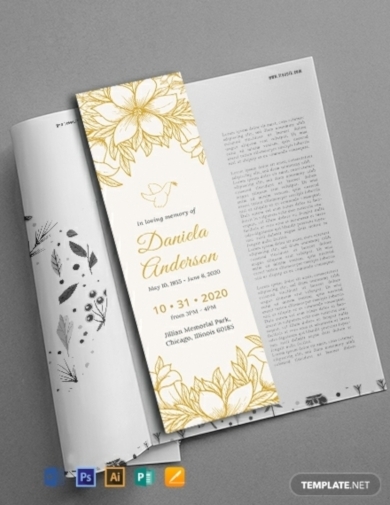 We hope that with the help of this article, you will be able to create a funeral bookmark design for your dearly departed loved ones. It is through funeral bookmarks that will make it possible for you to keep the memories of your deceased loved ones alive and well in your heart wherever you may go. Do not forget that you can easily download these templates and customize these using various editing software applications such as Adobe Creative Suite and Microsoft Office Suite.